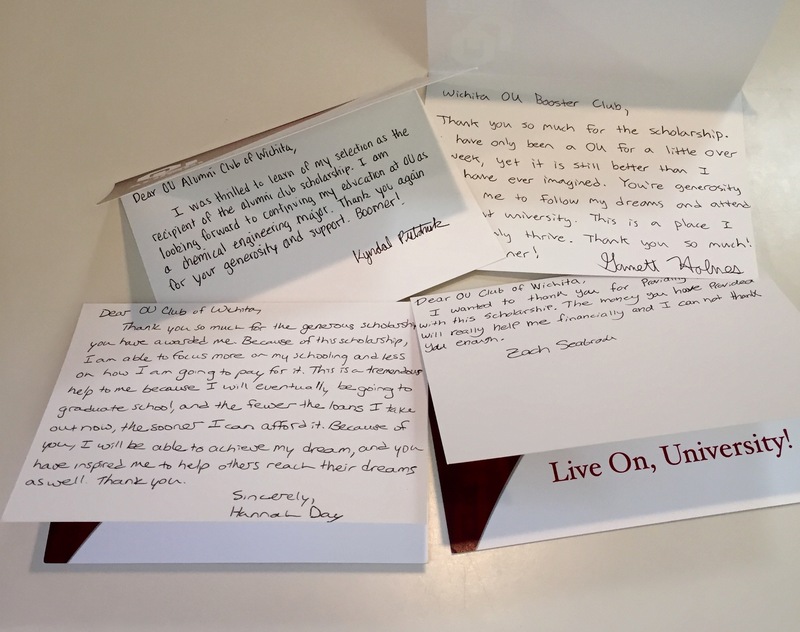 Four Wichita-area students awarded scholarships from the OU Club of Wichita. All begin their OU careers in the fall of 2015. They are Hannah Day from Wichita Northwest, Garrett Holmes from Maize South, Kyndal Pistotnik and Zachary Seabrook, both from Andover. Hannah Day graduated first in her class with a perfect 4.0 grade point average. She intends to study architectural engineering. “Hannah is not only a joy to work with but a wonderful example, hard worker and determined to succeed. Quitting is not in her vocabulary.” Gail Starns, Bethel Life Center. Garrett Holmes is a football player and swimmer who graduated 7th is his class at Maize South. He finished at Maize South with a 4.0 grade point average and will study Biology and pre-med at OU. What Garrett says, “”I have always had an interest in the human body and in science, but until then, I did not know which career path I would follow. Kyndal Pistotnik takes a 4.0 grade point average to OU where she’ll study Mechanical Engineering and Pre-Med. She is well rounded in school participation. She is a student athlete (tennis & swimming), student government representative and a volunteer with the American Heart Association. Zachary Seabrook claims to have been an OU fan since the days he was born. The high school basketball and football player is undecided as to his course of study. He graduated 20th in his class at Andover. “I can say without reservation that he is a commendable student who exhibits strong leadership qualities. He is an admirable representative of Andover High School and a worthy candidate for scholarship recognition.” Jon M. Lee, English Instructor and Head Football Coach, Andover High School. Posted in News and tagged OU_Club_of_Wichita.